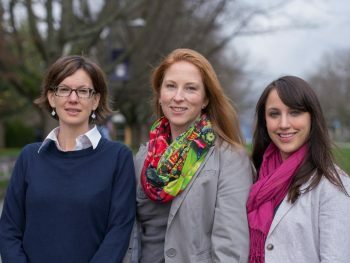 Three UBC Animal Welfare Program alumni have joined forces to create an accreditation program that will encourage wildlife and rodent control companies to make ethical decisions when controlling wildlife populations. Sara Dubois (PhD & MSc, Animal Science, 2014 & 2003), Nicole Fenwick (MSc, Animal Science, 2005) and Erin A’tman Ryan (BSc Applied Biology, Major in Applied Animal Biology, 2014) have consulted extensively with the pest control industry in the province and with animal welfare scientists internationally, to create humane wildlife control standards to inform the novel accreditation program. Dubois and Professor David Fraser initiated the project in 2014 with an application to the Peter Wall Institute. The Wall Solutions Initiative enables UBC faculty members to address issues of societal importance through innovative, interdisciplinary and academically rigorous research projects. UBC researchers engage with end-users or community partners – in this case the BC SPCA – to develop innovative research solutions that can be adopted by those end-users or other target communities. The Peter Wall Institute recently awarded the project a third and final year of funding, bringing its support to a total of $150,000. This funding enabled the hiring of Erin Ryan in December 2014 and her continued salary as a Research Coordinator on the project. Nicole Fenwick joined the project officially as Manager of Research and Standards in April 2016, after matching grant funding of $180,000 was received from the Vancouver Foundation to develop the operations of the accreditation program. With program development supported by these grants, future program operations will be run as a cost-recovery social enterprise by the BC SPCA. The first-of-its-kind accreditation program will be piloted with a select group of BC pest control companies next year, with an eye towards a full provincial roll out in 2018, and a national strategy in 2019. To date, Dubois and her team have worked on standards for more than 70 wild animals, hosted an international expert forum on wildlife control, published related articles, reports and knowledge translation tools, presented to the pest control industry and humane associations in Canada, and partnered with three student teams in the Sauder Business School Masters of Management Community Business Project on a feasibility study, business plan and most recently a marketing plan.